Pretty much covers all the bases in micro & macro. Overall good book to have to review subjects that school textbooks lack I explaining. I like how it's both micro and macro economics because my school offers them as either/or classes. 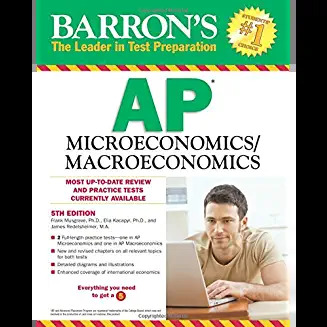 (either micro or macro) I bought it about 5 months before the ap exams and didn't use them until the day before because I'm lazy. 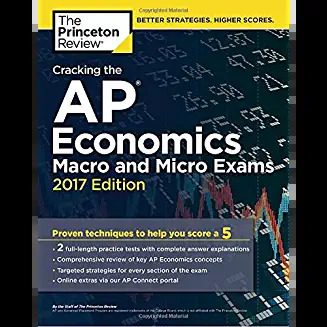 Safe to say after not studying micro economics for 5 months and trying to memorize every page of this book an hour before exams I got a 3. ...........at least I tried. Get your hands on this book. It's content and thrust should carry the (harried) student over the hump, quickly! The author has done a magnificent job in synthesizing a challenging (yet rewarding) subject to a level that an aspiring student of economics can apprehend, and own. I recommend THIS book! This book definitely helped me get a 4 on this years exam. In only about 80 or so pages you learn everything about macroeconomics. This book Also contained a full length test that shows you why you got the answers wrong. It most certainly helped me get a clear understanding of difficult concepts. If you are having trouble in economics like I was, I would definitely reccomend getting this book! Awesome review book. Covered everything that I learned in class plus a subject or two that wasn't taught. Highly recommend for anyone in the course, whether first or last in their class; it will be helpful. Definitely get it at least 2 weeks before taking the exam though, it's pretty dense. My son is a senior and taking this class. The teacher recommended the book as a supplement to the classroom text and my son has been grateful to have the additional viewpoint on certain concepts. He's loving the class and feels well prepared for the upcoming test. I was on the fence about spending more money when they get a textbook in class already, but he says it's totally worth it.